There is an epidemic of obesity and the metabolic syndrome in the United States and across the world. Both entities are associated with high mortality, mainly as a result of cardiovascular disease. The epidemic of obesity has been paralleled by an increase in the incidence of chronic kidney disease (CKD). Several recent epidemiologic studies have shown that obesity and the metabolic syndrome are independent predictors of CKD. In addition to diabetes and hypertension, several other mechanisms have been postulated to initiate and maintain kidney injury in patients with obesity and the metabolic syndrome. This article reviews the recent epidemiologic data linking obesity and the metabolic syndrome to CKD and summarizes the potential mechanisms of renal injury in this setting, with a focus on the role of inflammation, lipotoxicity, and hemodynamic factors. Potential preventive and therapeutic modalities based on the limited evidence available are discussed. Obesity is becoming a worldwide epidemic. The prevalence of overweight (body mass index [BMI] 25 to 29.9) and obesity (BMI ≥30) is approximately 66% in the United States (1). Obesity increased significantly from 23 to 30.5% between 1988 and 2000, and the increase occurred for both men and women and for all age groups (2). Since then, the trend for increased prevalence has continued, particularly for adolescents and men (1). Obesity is also on the rise in other industrialized countries (3–5). The metabolic syndrome, previously known as syndrome X and a major consequence of obesity, is also on the rise (6). According to the Third National Health and Nutrition Examination Survey (NHANES III), the prevalence of the metabolic syndrome in the United States is 23% in those who are 20 yr or older and >40% in those who are 60 yr or older (7). According to the Third Adult Treatment Panel of the National Cholesterol Education Program, the metabolic syndrome is defined as the presence of at least three of the following criteria, with or without diabetes: Central obesity (waist circumference in men >102 cm and in women >88 cm), hypertriglyceridemia (≥150 mg/dl), low HDL cholesterol (men <40 mg/dl, women <50 mg/dl), elevated fasting glucose (>110 mg/dl), and hypertension (≥130/85 mmHg) (8). A central feature of the metabolic syndrome is insulin resistance, which results in hyperglycemia and hyperinsulinemia, and eventually leads to the development of diabetes (9). Central obesity is the most important predisposing factor for insulin resistance (9). Chronic inflammation is another feature of the metabolic syndrome, which, together with insulin resistance, results in complex metabolic derangements that contribute to the pathogenesis of hypertension, lipoprotein abnormalities, atherosclerosis, coronary artery disease, and other organ dysfunction (10,11). Both obesity and the metabolic syndrome are associated with high mortality, mainly related to cardiovascular disease (12,13). Overweight, obesity, and the metabolic syndrome have recently emerged as strong independent risk factors for chronic kidney disease (CKD) and ESRD. This article reviews the epidemiology of CKD in relationship to obesity and the metabolic syndrome and the possible mechanisms of renal injury that is caused by obesity and obesity-initiated metabolic syndrome, with a focus on the role of inflammatory cytokines, abnormal lipid metabolism, and potential hemodynamic factors that remain largely underappreciated. Hypertension and diabetes, two major consequences of obesity and the metabolic syndrome and certainly important contributors to CKD, are beyond the scope of this review. Several epidemiologic studies recently showed that obesity is associated with CKD and ESRD. Iseki et al. (14) found that a high BMI was associated with an increased risk for ESRD in men in a population of >100,000 in Okinawa, Japan. The risk was independent of the presence of hypertension or proteinuria. In a large cohort of >320,000 patients who were followed at Kaiser Permanente, Hsu et al. (15) found that a higher BMI was a strong independent risk factor for ESRD even after adjustment for other major risk factors that are associated with ESRD, including smoking, baseline hypertension, and diabetes. The adjusted relative risk for ESRD increased steadily from a lower to a higher BMI and reached up to 7 for a BMI >40 kg/m2. In a recent case-control study, Ejerblad et al. (16) found that both men and women who had a BMI ≥25 kg/m2 at ages 20, 40, and 60 had a three-fold elevated risk for CKD compared with leaner patients. For patients with a BMI ≥35 kg/m2, the odds ratio (OR) for developing CKD was 2.2 for those without diabetes and 2.8 for those without hypertension. The OR was even higher at 17.7 for individuals with diabetes and a BMI ≥35 kg/m2. Speckman et al. (17) examined the relationship between obesity and a family history of ESRD in >25,000 dialysis patients in the United States. In this study, overweight and obese individuals had 17 and 40%, respectively, greater odds for reporting a family history of ESRD compared with lean patients, after adjustment for major risk factors including history of diabetes and hypertension. Thus, obesity seems to be an independent risk factor for both CKD and ESRD, and that risk may be linked to genetic or environmental factors or both. Given the potential bias that is inherent to the design of these studies, a causal relationship between obesity and CKD cannot be ascertained but is highly likely. It is interesting that none of these studies examined the relationship between body fat distribution (central versus peripheral adiposity) and the risk for CKD, even though central adiposity is a better predictor of hypertension, dyslipidemia, and the metabolic syndrome than BMI alone (18). The relationship of the metabolic syndrome to CKD also was recently examined. Chen et al. (19) studied the risk for development of CKD over time in a cohort of the NHANES III that included >7800 participants who had normal renal function at baseline and were followed for >21 yr. They found that the multivariate-adjusted OR for CKD was 2.6 for individuals with compared with individuals without the metabolic syndrome. The OR increased from 1.89 to 5.85 with increasing traits of the metabolic syndrome. Importantly, the relationship persisted after exclusion of individuals with diabetes. They also found a two-fold increase in the risk for microalbuminuria that correlated with the number of traits of the metabolic syndrome. Kurella et al. (20) reported similar findings in a comparable cohort and reported a higher risk for CKD even after adjustment for subsequent development of diabetes and hypertension. Palaniappan et al. (21) demonstrated a higher risk for microalbuminuria in men and women with the metabolic syndrome. Insulin resistance and hyperinsulinemia in the absence of diabetes have also been found to predict CKD (22). Thus, the metabolic syndrome, even in the absence of hyperglycemia or diabetes and independent of hypertension, predisposes to CKD. These data suggest that renal dysfunction may start long before the appearance of hypertension or diabetes in patients with the metabolic syndrome and hint that mechanisms other than these two obvious diseases may underlie renal dysfunction. The question still remains whether obesity and the metabolic syndrome can, indeed, initiate renal injury. Kincaid-Smith (23) challenged the long-held dogma that hypertension accounts for >30% of cases of ESRD in the United States and suggested that the metabolic syndrome and insulin resistance could be the real culprits in glomerulosclerosis that is attributed to “hypertensive nephrosclerosis.” This is supported by the fact that there are no rigorous clinical or pathologic studies to provide strong evidence of a cause-and-effect relationship between hypertension per se and ESRD, especially in white individuals (24). Is obesity or obesity-initiated metabolic syndrome, then, the missing link? Whereas clinical observations (24) and epidemiologic studies (14–17,19–22) are strongly suggestive, this theory remains largely unproved in humans, mainly because studies that are designed to examine a cause-and-effect relationship are lacking. Nevertheless, several small studies hinted that CKD is temporally related to obesity, independent of hypertension. For instance, obesity was shown to affect independently the progression of preexisting renal diseases, such as in IgA nephropathy (25), in patients with unilateral renal agenesis (26), or after unilateral nephrectomy (27). Furthermore, kidneys that were obtained from obese donors (BMI >30) were more likely to exhibit a lower GFR and a higher rate of allograft dysfunction over several years than kidneys that were obtained from lean individuals (BMI <25) (28). These data suggest that obesity contributes to and perhaps even initiates CKD. It is not clear what the impact of obesity per se on CKD is, independent of diabetes and hypertension, because the latter two conditions often are associated with obesity. For instance, hypertension and morbid obesity coexist in 50 to 70% of cases (23). Diabetes is also prevalent in obese individuals (15), and the prevalence varies according to gender and ethnicity. Furthermore, most published epidemiologic studies that associated CKD with obesity included a mix of patients with diabetes and hypertension, and their primary end points were not restrictive to obese patients without diabetes or hypertension. Therefore, such studies are unable to separate completely the effects of these two diseases from obesity on renal function. Quantifying the real impact of obesity on renal function requires the design of longitudinal studies that target morbidly obese individuals without hypertension or diabetes or examine renal biopsy specimens from obese individuals who have diabetes or hypertension and also are morbidly obese. To our knowledge, such studies have not been published. Several studies have linked microalbuminuria and variable degrees of proteinuria to obesity (19,29–31). Clinically, patients may present with the nephrotic syndrome (32), although, more often, they do not have nephrosis (27,29,30). In a series of 15 obese patients, Praga et al. (30) reported the absence of features of nephrotic syndrome despite heavy proteinuria. The 10-yr renal survival was only 51% in this series. Similar findings were found in a large series reported by D'Agati et al. (29). The histopathology of proteinuric obese patients consists of glomerulomegaly with or without FSGS (29). These patients tend to have less podocyte injury and a more indolent progression than patients with idiopathic FSGS (29). These glomerular changes have been termed obesity-related glomerulopathy (29). The latter is thought to be related to altered renal hemodynamics, namely increased renal blood flow, hyperfiltration, and increased filtration fraction, the basis for which is explained in subsequent paragraphs (33,34). However, it is likely that these observations are somewhat biased by the fact that renal biopsies are usually obtained only in patients with proteinuria. Therefore, obesity-related glomerulopathy may not be the only histopathologic feature of obesity-related renal disease, particularly in nonproteinuric obese patients with renal dysfunction. For instance, tubulointerstitial nephropathy may well be present and may precede the onset of proteinuria in some obese patients; however, this has not been studied. In an attempt to examine the early renal histopathologic changes that are associated with obesity, Rea et al. (35) examined renal biopsy specimens from obese kidney donors without renal dysfunction and compared them with those from nonobese control subjects. They found increased glomerular planar surface area and more tubular dilation in obese patients, without any other major significant differences. The significance of these findings is unclear but could be related to mismatch of nephron number to body size or to hyperfiltration in obese individuals. The mechanisms by which obesity/metabolic syndrome may initiate and exacerbate CKD remain elusive and largely speculative. In addition to hemodynamic factors that are related to obesity, inflammatory and metabolic effects that are related to obesity and obesity-initiated metabolic syndrome have been implicated (10,36) (Figure 1). 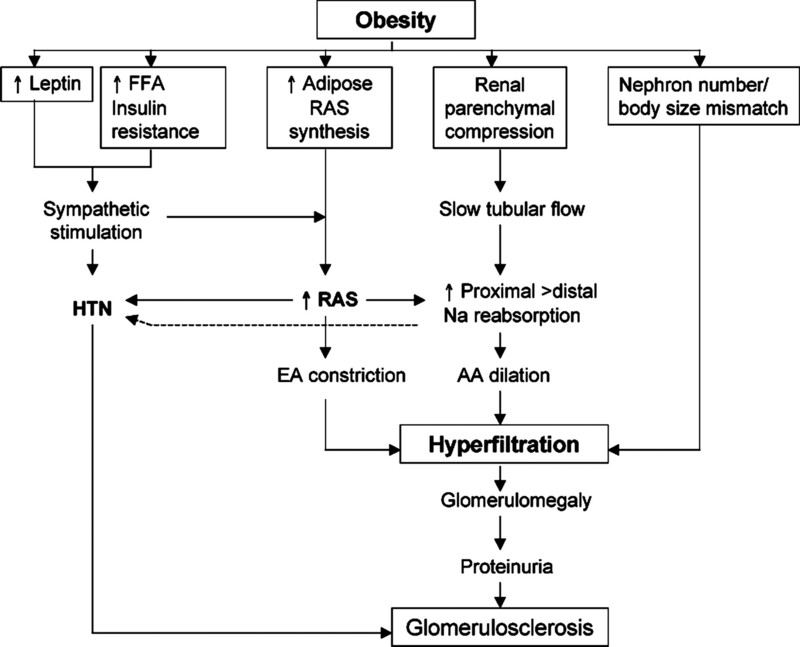 Potential mechanisms of renal injury in patients with obesity and obesity-initiated metabolic syndrome. The hallmark of the metabolic syndrome is insulin resistance. Insulin is an anti-inflammatory hormone; therefore, resistance to its action may explain why obesity/metabolic syndrome is a proinflammatory state (11,37). Furthermore, inflammatory mediators such as TNF-α have been shown to mediate insulin resistance (38). Plasma concentrations of some proinflammatory adipokines (cytokines secreted by adipose tissue) such as IL-6, TNF-α, C-reactive protein (CRP), and resistin are elevated in patients with the metabolic syndrome, whereas the levels of other anti-inflammatory adipokines such as adiponectin are reduced, which may contribute to insulin resistance (11,37). Thus, insulin resistance potentiates chronic inflammation and vice versa. Which is the chicken and which is the egg in the initiation of the metabolic syndrome is difficult to ascertain. Several studies have shown that adipose tissue, especially visceral adipose tissue, is a major source of cytokine secretion in the metabolic syndrome and that inflammatory cells, especially mature bone marrow–derived macrophages, invade adipose tissue early in obesity (39,40). These cytokines could be produced by the adipocyte (e.g., leptin), macrophages infiltrating the adipose tissue (e.g., TNF-α), or both (e.g., IL-6) (11). Visceral adipose tissue is now considered an endocrine organ and a site for elaboration and secretion of hormones and cytokines (11). Inflammation is a major risk factor for atherosclerosis in the general population (41) and has been strongly associated with the metabolic syndrome (42,43). More recently, inflammation was linked to obesity and the metabolic syndrome in patients with CKD. Ramkumar et al. (44) found a strong association between inflammation as defined by a CRP level >3 mg/dl and a high BMI in patients with CKD. The same investigators also found that, in the NHANES III cohort, the presence of the metabolic syndrome was associated with greater odds for inflammation for various levels of creatinine clearance (45). Wu et al. (46) found increased expression of genes that are related to lipid metabolism (LDL receptor, fatty acid binding protein-3, and sterol regulatory element binding protein [SREBP-1]), inflammatory cytokines (TNF-α and its receptors, IL-6 signal transducer, and IFN-γ), and insulin resistance (glucose transporter-1 and vascular endothelial growth factor) in glomeruli of patients with obesity-related glomerulopathy compared with gender- and age-matched glomeruli of control donor kidneys. These findings somewhat strengthen the speculation that inflammatory cytokines and lipid byproducts affect renal function in obese patients, but this is yet to be proved definitively. In the following sections, we focus on the specific roles of the likely “nephrotoxins” in obesity/metabolic syndrome (Figure 2). Potential mechanisms of renal dysfunction related to inflammatory cytokines and lipotoxicity in obesity and obesity-initiated metabolic syndrome. MCP-1, macrophage colony stimulating protein-1; PAI-1, plasminogen activator inhibitor-1; RAS, renin-angiotensin-aldosterone system; PPAR, peroxisome proliferator–activated receptor; SREBP, sterol regulatory element binding proteins; VLDL R, VLDL receptors; TG, triglycerides; FFA, free fatty acids; ROS, reactive oxygen species; DAG, diacylglycerol. Leptin is an adipocyte-derived hormone that is structurally similar to IL-2 and is largely considered a cytokine. Increased caloric intake and decreased expenditure result in increased adiposity, which results in increased leptin levels (11,47–49). Leptin crosses the blood-brain barrier, and via reducing neuropeptide Y in the hypothalamus suppresses appetite and increases energy expenditure. In addition, it increases insulin sensitivity in various tissues. Patients with obesity and the metabolic syndrome are resistant to the hypothalamic effects of leptin and have elevated leptin levels (11,46–49). Because the short form of leptin receptor (Ob-Ra) is abundantly expressed in the kidney (50), leptin is a likely candidate to affect directly renal structure and function. In support of this hypothesis, recombinant leptin stimulates the proliferation of cultured glomerular endothelial cells (but not mesangial cells) and increases TGF-β1 mRNA expression and production (51). When infused in rats, leptin produces the same effects (51). After several weeks of infusion of either leptin or a vehicle, leptin significantly increased type IV collagen protein, glomerulosclerosis, and proteinuria without increasing BP (51). Leptin also stimulates glucose uptake, mRNA expression of TGF-β type 2 receptor, and type I collagen production in cultured mesangial cells of db/db leptin-deficient obese mice (52). These data indicate the leptin may play a role in the glomerulosclerosis that is observed in obese patients with proteinuria and/or CKD, independent of hypertension. Leptin may also affect the kidney indirectly. It increases sympathetic nerve trafficking and renal sodium retention, which may cause hypertension (49). Furthermore, it stimulates oxidative stress in endothelial cells and induces a proinflammatory state as a result of stimulation of Th1 cells (11,36,49). Such effects may promote atherosclerosis. In support of this hypothesis, leptin has been shown to be an independent risk factor for cardiovascular events after adjustment for obesity and metabolic risk factors (53). Conversely, obese leptin-deficient mice are protected from atherosclerosis despite the presence of other risk factors (54). Thus, atherosclerosis and endothelial dysfunction are other potential mechanisms by which leptin may affect renal structure and function, possibly before the development of diabetes or hypertension. IL-6 is a pleiotropic cytokine that is produced from both visceral and peripheral adipose tissue cells and immune cells, with hormonal effects on many tissues (11,40). Plasma IL-6 levels positively correlate with obesity and insulin resistance and predict the development of type 2 diabetes and future coronary events (11). IL-6 mediates insulin resistance (55), increases platelet activity and atherogenicity, increases the expression of adhesion molecules on endothelial and vascular smooth muscle cells (11), and activates the local renin-angiotensin system (RAS) (56), effects that are widely known to promote cellular injury. IL-6 was shown to enhance TGF-β1 signaling via modulation of TGF-β1 receptor trafficking, an effect that may enhance renal fibrosis (57). IL-6 controls the hepatic acute-phase response (58) and likely controls CRP production by the liver (59). CRP is a strong marker for atherosclerotic disease and cardiovascular events (59–61), and its levels are elevated in the metabolic syndrome and with visceral adiposity (62,63). Furthermore, new data suggest that CRP may not be just a marker of inflammation and cardiovascular risk but also a contributor to vascular damage and cardiovascular events (64,65). In support of this hypothesis, therapeutic inhibition of human CRP infused in rats was recently shown to reduce myocardial infarct size and improve cardiac function (66). IL-6 and CRP are thus other likely candidates that may mediate renal injury in patients with the metabolic syndrome. TNF-α is produced by macrophages within adipose tissue, and its levels are elevated in the metabolic syndrome (11,67). TNF-α is one of the mediators of insulin resistance in adipose tissue (38). The mechanisms involve inactivation of insulin receptor and insulin receptor substrate-1 (68), induction of lipolysis and hepatic lipogenesis resulting in increased levels of free fatty acids (FFA), and reduction of adiponectin (an insulin-sensitizing hormone) secretion by adipocytes (69,70). TNF-α has been shown to mediate inflammation in several models of renal injury, including glomerulonephritis (71), acute renal failure (72), and tubulointerstitial injury (73). Binding of TNF-α to its receptors, particularly TNF-α type 1 receptors, mediates its effects, causing macrophage infiltration, upregulation of inflammatory cytokines NF-κB and TGF-β1, and apoptosis (72,74). These cytokines may be toxic to renal epithelial, mesangial, and endothelial cells. However, the specific role of TNF-α in metabolic syndrome–induced renal injury has not been studied. Macrophage and monocyte chemoattractant protein-1 (MCP-1), plasminogen activator inhibitor-1 (PAI-1), resistin, adipsin (complement factor D), and acylation-stimulating protein are other proinflammatory cytokines that are produced by adipose tissue and/or inflammatory cells (75). Their levels are increased in patients with the metabolic syndrome. They have been shown to exacerbate or mediate insulin resistance, promote FFA uptake by cells, increase lipoprotein levels, and promote atherogenesis and thrombogenesis (75), effects that may directly or indirectly affect renal structure and function. 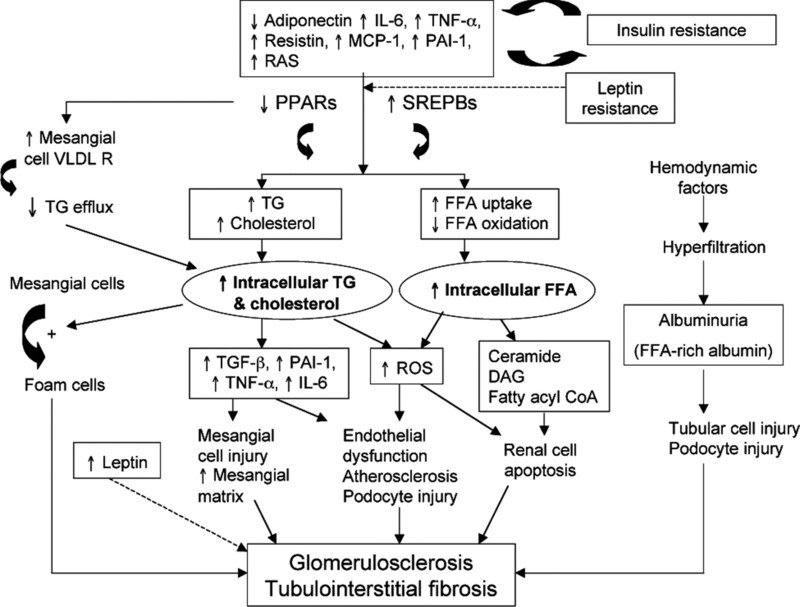 The contribution of insulin resistance and lipotoxicity to renal dysfunction are discussed. Adiponectin is an adipokine with insulin-sensitizing, anti-inflammatory, and anti-atherogenic properties (75–77). Its levels correlate negatively with fat mass, body weight, BP, insulin resistance, inflammatory markers of the metabolic syndrome, and high triglyceride (TG) and LDL cholesterol levels and positively with HDL cholesterol and weight loss (76,78). Adiponectin-deficient mice exhibit neointimal thickening and increased proliferation of vascular smooth muscle cells (79). Hypoadiponectinemia is associated with vascular dysfunction and with cardiovascular events in patients without CKD (80,81). Adiponectin may thus be important in preventing some of the deleterious effects that the chronic inflammatory state may have on various organs; however, a specific relationship to kidney injury has not been studied. It is interesting that in patients with CKD, the significance of adiponectin levels is controversial. For instance, Becker et al. (82) found that low adiponectin levels in patients with mild or moderate renal failure were correlated with cardiovascular events, whereas Menon et al. (83) found that in patients with stage 3 or 4 CKD, all-cause and cardiovascular mortality were paradoxically higher in those with high adiponectin levels. Whether adiponectin is renoprotective and whether it is cardioprotective in patients with CKD is still not clear. Activation of the RAS and increased circulating levels of renin, angiotensinogen, angiotensin-converting enzyme, aldosterone, and, to some extent, angiotensin II (AngII) are common in obese individuals despite sodium retention and an apparently increased extracellular fluid volume (84,85). Several mechanisms have been implicated: (1) sympathetic stimulation, which is partly related to hyperleptinemia, and possibly hyperinsulinemia and insulin resistance (86);(2) hemodynamic alterations, including interference with renal blood flow as a result of compression of the renal hilum and/or renal parenchyma by visceral fat (36), or perhaps other unstudied hemodynamic factors such as raised intra-abdominal pressure or cardiopulmonary dysfunction (see Hemodynamic Factors); and (3) synthesis of several proteins of the RAS by visceral fat (87,88). Most of the data on adipose tissue synthesis of the RAS proteins are derived from animal studies (87). There is a paucity of human studies, but some data support this hypothesis. Giacchetti et al. (89) recently found a significantly higher expression of angiotensinogen and AngII type 1 receptor mRNA in visceral adipose tissue than subcutaneous fat of both obese and lean individuals. Engeli et al. (85) studied expression of RAS components in visceral fat but did not find any significant differences between obese and lean individuals. It is conceivable, however, that the larger adipose fat mass in obese individuals is partly responsible for the increased circulating levels of RAS hormones. In support of this hypothesis, a 5% weight loss in obese individuals resulted in significant reductions of circulating levels and adipose tissue expression of RAS hormones (85). AngII is widely known to affect adversely progression of renal disease in several models of renal injury and in patients with CKD. A review of the mechanisms that are responsible for this phenomenon is beyond the scope of this article, but hypertension, raised intraglomerular pressure, exacerbation of proteinuria, induction of intrarenal inflammatory cytokines and growth factors, and apoptosis are some of the deleterious effects of AngII on the kidney (90). In addition, AngII may have a role in the regulation of adipokine production in adipose tissue and may increase insulin resistance in the setting of obesity (87,88). In support of this hypothesis, the AngII type 1 receptor blocker olmesartan significantly reduced TNF-α, PAI-1, MCP-1, and markers of oxidative stress and increased adiponectin levels in the obese KKAy mouse model (91). Thus, AngII may directly or indirectly affect renal function and structure in individuals with obesity or the metabolic syndrome via hypertension, inflammation, and abnormal lipid metabolism. These effects, however, need further confirmation in humans. In addition, the relative contribution of the kidneys, adrenals, and adipose tissue to circulating levels of RAS hormones and the contributions of the RAS to renal dysfunction in humans with obesity and the metabolic syndrome deserve further study. Cellular lipid overload, or “lipotoxicity,” is a well-documented phenomenon that contributes to atherosclerosis (92–94). Lipotoxicity is associated with obesity and obesity-initiated metabolic syndrome and is thought to contribute to organ dysfunction, including renal disease (10,92). It involves the cellular accumulation of nonesterified FFA and TG (94). To understand this concept, a brief review of the metabolic lipid derangements that are associated with the metabolic syndrome is necessary. High caloric feeding is thought to initiate the metabolic syndrome by increasing abdominal adipose fat mass in susceptible individuals, probably as a result of genetic factors and physical inactivity (8,10). Abdominal adipose tissue generates high levels of circulating FFA. Low adiponectin levels, leptin resistance, and other cytokines that are released from both adipose tissue cells and inflammatory cells that infiltrate adipose tissue (e.g., macrophages) reduce FFA uptake by mitochondria in various tissues, reduce FFA oxidation, and promote intracellular FFA accumulation (10,95,96). Excess intracellular FFA and their metabolites (fatty acyl CoA, diacylglycerol, and ceramide) promote insulin resistance (and eventually hyperinsulinemia and hyperglycemia), exert deleterious effects on various organs, and have been shown to be cytotoxic to pancreatic β cell, liver, heart, and endothelial cells. This results in pancreatic β cell dysfunction, hepatic steatosis, cardiomyopathy, and atherosclerosis (10,95,96). The mechanisms that are involved include protein kinase C activation, oxidative stress, NF-κB activation, calpain-10 activation, and others, all of which result in inflammation, apoptosis, and cell necrosis (94,97). FFA overload also stimulates the hepatic synthesis of TG and VLDL, which are then metabolized to highly atherogenic LDL and oxidized LDL (10,98). These lipoproteins may be lipotoxic. The transcription of many lipogenic genes is controlled by SREBP, which are important regulators of both fatty acid and cholesterol metabolism (99–101). Three isoforms exist (SREBP-1a, SREBP-1c, and SREBP-2). SREBP-1 activates genes that are involved in fatty acid synthesis, including acetyl CoA carboxylase and fatty acid synthase, whereas SREBP-2 preferentially activates genes that regulate cholesterol synthesis such as hydroxymethylglutaryl CoA (HMG-CoA) synthase and reductase (99–102). Peroxisome proliferator–activated receptors (PPAR) are other nuclear hormone-activated receptors and transcription factors that recently gained wide attention because of their crucial role in adipogenesis, regulation of insulin sensitivity, and lipid metabolism (103–105). Three PPAR isoforms are expressed in various tissues, including adipose tissue, liver, muscle, heart, and kidney (103). The specific roles of the various PPAR have been elucidated. For instance, PPAR-α agonists (e.g., the fibrates) have been shown to promote FFA oxidation and insulin sensitivity (106). PPAR-δ and PPAR-γ promote adipogenesis and insulin sensitivity, enhance adiponectin activity, increase HDL, reduce TG and LDL, mediate cellular efflux of lipids, and modulate foam cell and macrophage activation in atherosclerosis (103). PPAR-γ agonists such as the thiazolidinediones have been shown to improve insulin sensitivity in the setting of type 2 diabetes (107). Taken together, the SREBP and PPAR are emerging as important players in lipid metabolism in the metabolic syndrome. The role that SREBP and PPAR may be playing in various models of renal injury is being investigated (see Renal Lipotoxicity). The association between lipids and renal disease was first suggested in 1858 by Virchow, who described fatty degeneration of the renal epithelium in Bright's disease (108). Renal lipotoxicity was later revisited by a number of investigators who postulated that lipids may cause renal mesangial and epithelial cell injury and may promote renal disease progression (109–111). In support of this hypothesis, treatment with HMG-CoA reductase inhibitors has been found in a limited number of studies to improve proteinuria and preserve renal function independent of other variables (112–114), suggesting a role for lipids per se in promoting renal injury. The mechanisms of renal lipotoxicity are not fully elucidated, but a number of experiments suggested a role for TG-rich lipoproteins, FFA and their metabolites, and albumin-loaded FFA in renal cell injury. A series of studies by Levi et al. demonstrated the crucial role of SREBP in promoting renal injury. The investigators used mouse models of diabetes, aging, and obesity, all of which share common renal histopathologic features. They showed that high-fat feeding resulted in obesity, hyperglycemia, and hyperinsulinemia in the obesity-prone C57BL/6J mice but not in the low-fat–fed counterparts or the obesity-resistant A/J mice (115). High-fat–fed C57BL/6J mice showed significantly increased renal TG and cholesterol accumulation in both glomerular and tubulointerstitial cells (115). They also showed significant renal overexpression of SREBP-1 and SREBP-2 protein, acetyl CoA carboxylase, fatty acid synthase, PAI-1, type IV collagen, and fibronectin (115,116). Significant glomerulosclerosis and proteinuria occurred in these mice. AngII was shown to increase renal SREBP-1 expression and lipid accumulation in renal tubular and vascular wall cells (117). In other mouse models of type 1 diabetes (Akita and OVE25 mice), similar findings were observed, in addition to reduced expression of PPAR-α and PPAR-δ (118). Transgenic overexpression of SREBP-1a promoted glomerulosclerosis, tubulointerstitial injury, and lipid accumulation in glomeruli and tubules (119). In contrast, mutant mice that lacked SREBP-1c were protected from these effects when fed a high-fat diet (115). These experiments highlight the potential role of lipid-regulatory proteins and FFA in renal cell injury in obesity that is induced by high-fat diet and in diabetes. FFA overload may also result in endothelial dysfunction likely via enhanced production of reactive oxygen species (ROS) (120–122). In a rodent model of visceral obesity, the Zucker diabetic fatty (fa/fa) leptin resistant rat, Chinen et al. (123) recently demonstrated impaired vasodilator response to acetylcholine, high levels of circulating FFA and ROS, and an enhancement of NADPH oxidase activation and vascular ROS production. Pitavastatin, an HMG-CoA reductase inhibitor, reversed these effects. FFA may also increase vascular tone via stimulation of the sympathetic nervous system or via other unclear mechanisms (86). “Vascular lipotoxicity” may thus be another mechanism via which hypertension, microalbuminuria and glomerulosclerosis develop in patients with visceral obesity. TG-rich lipoproteins such as VLDL, intermediate-density lipoprotein and LDL have been shown to promote cultured mesangial cell proliferation (124,125). Oxidized LDL has been shown to stimulate the secretion of excess extracellular matrix, MCP-1 and PAI-1 from mesangial cells (92,126,127). These effects may be related to binding of these lipoproteins to VLDL and LDL receptors in mesangial cells (92,126). In addition, these lipids appear to promote the synthesis of cytokines such as IL-6, TNF-α, and TGF-β, all of which may cause glomerular injury (124,125). Abrass et al. (128) showed that IGF-I induces rat glomerular mesangial cells to accumulate TG, and that these cells are transformed into lipid-laden foam cells. This effect is mediated by endocytosis of TG (128). These foam cells are unable to function normally and show impaired phagocytosis and migration (129). Reduction of PPAR-δ appears to contribute to TG accumulation in mesangial cells, since PPAR-δ normally prevents this process by downregulating mesangial cell VLDL receptors and therefore TG uptake, and by promoting TG efflux from mesangial cells (128). In proteinuric renal diseases and the nephrotic syndrome, albumin-saturated FFA is filtered in excess and reabsorbed by endocytosis by the proximal tubules. Several experiments showed that this results in tubulointerstitial inflammation and fibrosis (130–133). The mechanisms are likely related to FFA lipotoxicity, and the release of nonpolar lipids by proximal tubular cells which attract macrophages and promote inflammation and apoptosis (130,132). PPAR-γ has been shown to mediate FFA-induced apoptosis (134). The importance of FFA in inducing tubular inflammation is supported by the fact that delipidated albumin is less toxic to isolated tubule cells than FFA-loaded albumin (134). The podocyte may be a target for toxicity by FFA per se or albumin-bound FFA. Thus proteinuria may result in tubulointerstitial and glomerular inflammation and eventually fibrosis, likely as a result of fatty acid-induced lipotoxicity. Taken together, these data suggest that lipotoxicity is very likely to affect renal structure and function in patients with obesity and obesity-initiated metabolic syndrome. Figure 2 summarizes the potential effects of inflammation and lipids on renal function. Further studies are needed to elucidate the potential specific nephrotoxic effects of lipid byproducts on renal cells. Hemodynamic factors probably play a significant role in obesity-induced renal dysfunction. Hemodynamic factors include hypertension, in addition to other plausible phenomena that remain largely unexplored. Hypertension, which is closely linked to obesity (86), is probably a major cause of renal dysfunction in obese patients but is likely not the sole hemodynamic cause. The causes of hypertension in obesity are complex, and a review of their mechanisms is beyond the scope of this article. Increased vascular tone and renal salt and water retention are the main initiators of hypertension in obesity. The underlying mechanisms include hyperleptinemia, increased FFA, hyperinsulinemia, and insulin resistance, all of which cause sympathetic nerve stimulation, increased vascular tone, endothelial dysfunction, and renal sodium retention (86). In addition, increased RAS activity, as a result of both sympathetic activation and possibly increased adipose tissue synthesis, results in increased renal sodium and water retention (36,86). There are potentially other mechanisms for renal salt and water retention, which are discussed next. Studies in animals and in humans have shown that obesity is associated with elevated GFR and increased renal blood flow (33,34). This likely occurs because of afferent arteriolar dilation as a result of proximal salt reabsorption, coupled with efferent renal arteriolar vasoconstriction as a result of elevated AngII. These effects may contribute to hyperfiltration, glomerulomegaly, and later focal glomerulosclerosis (29,30). Even though GFR is increased in obesity, urinary sodium excretion in response to a saline load is often delayed, and individuals exhibit an abnormal pressure natriuresis (135,136), indicating avid proximal tubular sodium reabsorption, likely as a result of both sympathetic activation and AngII effect. This may result in reduced salt delivery to the macula densa, as proposed by Hall et al. (36), which may thus cause afferent vasodilation, increased renin release, and hyperfiltration. Bagby et al. (10) suggested that intrauterine growth restriction may lead to decreased nephron number and impaired kidney development, which if coupled with an excessive infant “catch-up” growth after birth may result in a mismatch between body size and nephron number. This would predispose to nephron hyperfiltration and hypertension later in life. Figure 3 illustrates the factors that lead to hyperfiltration in obesity. Hemodynamic consequences of obesity leading to hyperfiltration and hypertension. HTN, hypertension; Na, sodium; AA, afferent arteriole; EA, efferent arteriole. It is interesting that not all studies have shown an increase in GFR and renal blood flow in obese individuals. Scaglione et al. (137) showed that the pattern of obesity affects renal hemodynamics and that an elevated BMI with central obesity results in reduced GFR, increased renal vascular resistance, and reduced effective renal blood flow as opposed to obesity with peripheral fat distribution. A greater waist-to-hip ratio was independently associated with a higher renal vascular resistance. In a large cohort (138), a central fat distribution in lean, overweight, or obese individuals and a high waist-to-hip ratio were found to be independently associated with diminished filtration, defined as the creatinine clearance (adjusted for body surface area) ± two times the SD of the creatinine clearance regression line of a group of lean control subjects without diabetes. Anastasio et al. (139) noted that GFR values in obese patients are substantially lower when adjusted for body surface area than when adjusted for height or lean body mass. Therefore, increased renal blood flow and hyperfiltration may not be universal findings in obese individuals, and values need to be interpreted in light of body fat distribution and method of GFR adjustment. It is not surprising that central fat distribution and a high waist-to-hip ratio were found to be associated with diminished filtration. Increased intra-abdominal pressure from visceral fat, a common occurrence in morbidly obese individuals (140–142), may cause renal vein compression and may therefore raise renal venous pressure and diminish renal perfusion (143). In addition, raised intra-abdominal pressure may cause increased inferior vena cava pressure, and this may impair venous outflow from the renal veins (144). In support of this hypothesis, measurement of ileofemoral venous pressures were found to be elevated in morbidly obese patients and positively correlated with intra-abdominal pressure (145). Raised intra-abdominal pressure has other hemodynamic consequences: Raised intrathoracic pressure, impaired right ventricular filling, pulmonary hypertension, and diminished cardiac output (146), all of which may impair renal perfusion. Furthermore, increased fat in the renal hilum may compress renal vessels and renal parenchyma, causing elevated renal interstitial fluid hydrostatic fluid and slower renal blood flow and renal tubular flow rates, as shown in obese dogs by Hall et al. (147). This may stimulate renal sodium retention and may contribute to hypertension. In support of this hypothesis, artificially and chronically increasing intra-abdominal pressure in dogs resulted in hypertension (148). Morbidly obese patients commonly have pulmonary hypertension, obstructive sleep apnea, and cor-pulmonale (149–152), factors that are known to increase right ventricular overload and to cause increased venous pressures, including increased inferior vena caval and renal vein pressures. In addition, cardiac dysfunction, particularly impaired right ventricular function (153–155) and, to a lesser extent, left ventricular function (156), has been described in patients with obesity. This may be related to impaired cardiopulmonary hemodynamics and reduced left ventricular cavity size and filling pressure or myocardial lipotoxicity. Conceivably, cardiac dysfunction may lead to impaired renal perfusion. Together, these hemodynamic effects may contribute to activation of the RAS, renal sodium retention, and possibly hypertension and renal dysfunction. Among the hemodynamic factors discussed, more data support hyperfiltration as the main contributor to renal dysfunction in obesity, but certainly hypofiltration is plausible, and more studies are needed to prove or disprove this hypothesis. Weight loss and increased activity are the cornerstones of the treatment of obesity and the metabolic syndrome. On the basis of our current understanding of the pathogenesis of the metabolic syndrome, many other adjunctive interventions may show promise. Bariatric surgery (157,158) and surgical resection of abdominal adipose tissue (77) improve the metabolic profile and reduce inflammatory cytokine levels both in the short term and up to 10 yr later (157). However, the long-term safety of these procedures has not been established. PPAR-α (the fibrates) (106) and PPAR-γ (the thiazolidinediones) agonists (107) improve insulin sensitivity, but they are not without risks in the setting of renal disease: Myopathy (159) and sodium and fluid retention (160), respectively. Blockade of the RAS is likely to be beneficial, but treatment will need to be individualized depending on the degree of renal dysfunction and the presence of other comorbidities that are associated with abdominal obesity, such as cardiopulmonary dysfunction and perhaps the pattern of fat distribution. HMG-CoA reductase inhibitors have shown promise in some patients with proteinuric renal diseases in small trials (112–114). Large, randomized, controlled trials to examine the effects of each of these interventions on renal function in patients with the metabolic syndrome are needed before any firm recommendations can be made. Obesity and the metabolic syndrome are independent risk factors for CKD. The potential mechanisms involve inflammation; lipotoxicity; hemodynamic effects; and perhaps other, unknown mechanisms. Animal and human studies to investigate the specific contributions of each of these mechanisms and to establish a cause-and-effect relationship to obesity-induced renal dysfunction are necessary at this point so that preventive and therapeutic interventions can be adopted. Agents that enhance insulin sensitivity, such as PPAR agonists, blockade of the RAS, and HMG-CoA reductase inhibitors, show promise as adjunctive therapies to prevent progression of renal disease in patients with the metabolic syndrome. However, in the absence of large, randomized, controlled trials, no firm recommendations can be made at this time. Weight loss and aggressive treatment of prediabetes, diabetes, and hypertension still constitute the most effective interventions for CKD prevention. R.H.M. is supported by National Institutes of Health grants U01 DK020013, U01 DK03012, and K24 DK059475.